For Sophie Gillette, Detective-Sergeant Homicide of the Service de Police de la Ville de Montréal (SPVM), it starts as a routine investigation of a hit-and-run death during a January snowstorm in Montreal. It ends in a terrorist plot to disable the electrical grid, behead a visiting governor, and kill thousands of hockey fans with poison gas. These two events sandwich between them a generous filling of biker wars, arms smuggling by First Nations warriors, militant student activists, drug financiers, and a rogue professor with a doctorate in chemical toxicology. As if all that wasn’t sufficient to keep Gillette occupied, she has recently suffered the loss of her brother to a covert military operation in Afghanistan, and her mother has turned to the bottle to assuage her grief. Gillette also has to deal with being an attractive woman in a male-dominated work environment. As with author Alan Annand’s other novels, the lead character in his latest offering, Al-Quebeca, has more than a heaping helping of issues with which to deal. Putting the two together, Annand came up with the idea for an executed-in-Canada terrorist plot. He keeps the investigation local by triggering it with a hit and run that is more than it initially seems. How his detective, Gillette, follows the trail of brain matter and paint chips to the terrorist source makes riveting reading. Annand is a master anxiety crafter. Much of Annand’s magic lies in his painstaking research. As with his other novels, he has been meticulous in attention to detail and verifying that what he crafts is credible. In addition to online research, he revisited (or visited for the first time) locations mentioned in the novel, interviewed experts, and arranged a tour of a hydroelectric facility. Then, of course, there was the challenge of writing from the female perspective. When asked about it, Annand says that writing from a female perspective was a challenge, but he had wanted his main character to “face the challenges of discrimination, physical struggle and self-doubt that made the choice of a female lead seem appropriate.” Annand succeeds in not only making Gillette a believable character, he manages to make the reader forget that she was written by a man. The above make Al-Quebeca an exciting, suspenseful novel with well-rounded characters and richness of setting and plot. But what makes it particularly compelling, as well as frightening, is how plausible it seems. 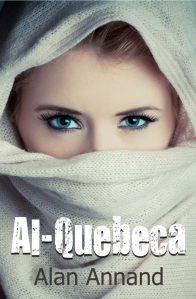 In an April 2013 Blog entry, Annand talks about the likelihood of something like this happening and says, “I wrote the first draft of my novel Al-Quebeca in 2009 and revised it several times since then. Each time it all seems even more inevitable” (“My novel ‘Al-Quebeca’ ripped from tomorrow’s headlines“, accessed July 30, 2013). Hopefully, author/astrologer Alan Annand hasn’t seen the events of his novel written in the stars. Toronto author Alan Annand writes crime fiction novels, offering a mix of thriller, mystery, and what he calls New Age noir. He has contributed articles to a variety of astrological magazines. Annand divides his time between his writing, meeting with clients, and giving classes on palmistry and Vedic astrology. He speaks at astrological conferences and New Age gatherings, and has appeared on CBC and CTV. He was also a guest on several radio programs. Fans of astrologer/palmist/private investigator Axel Crowe will be delighted to hear that Annand is currently hard at work on a sequel to Scorpio Rising and Felonious Monk. He also published an SF mystery, set in post-apocalyptic New York, called Antenna Syndrome. Available for purchase on Smashwords and Amazon.